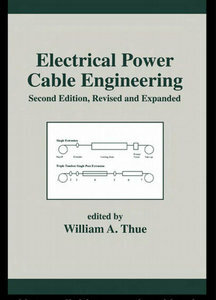 Electrical Power Cable Engineering, Second Edition remains the foremost reference on universally used low- and medium-voltage electrical power cables, cataloging technical characteristics and assuring success for cable manufacture, installation, operation, and maintenance. While segments on electrical cable insulation and field assessment have been revamped to reflect industry transformations, new chapters tackle distinctive topics like the location of underground system faults and the thermal resistivity of concrete, proving that this expanded edition lays the soundest foundation for engineering decisions. Electrical Power Cable Engineering, Second Edition meets its complex subject in a readable fashion, especially for those with limited background and experience…sufficient detail is provided for those with greater need in evaluating different cables for specific applications.